What is spring cleaning anyways? Who has time for that. Spring is one of the busiest times of the year especially for families and students. 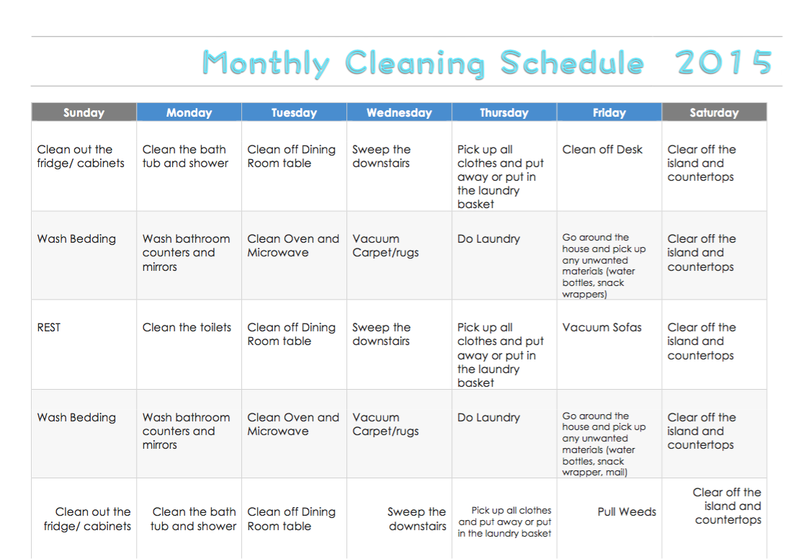 Midterms are approaching, your spring break is right around the corner and Easter time is a wonderful time to spend time with family not clean for them. Who has time to do any deep cleaning in that chaotic time frame? Not me. Summertime cleaning is when I develop my cleaning habits for the year.... or at least until the holidays. I might pick up the habits again around new years but they fade quickly. In order to keep my habits strong I organized a cleaning calendar. I'm a person who would rather do 15 minutes a day and keep a tidy house than have my house look spotless for one weekend out of the month. At first glance it looks like a lot but if you really look at it, each of these activities are super basic. These tasks don't include the daily dishwashing and kitchen happenings that are expected of any house keeper but you get the jist. If your a person who wants to tackle a lot of these projects in one day pick a day to do all the tasks for that week and then do the same thing again next week. The biggest struggle is not quitting. Don't become lazy because then your house will get sloppy. Share this calendar with your friends and family. Maybe this will help them to keep up with the messes that occur in their house.